Iain Hutchison, Russell Poynter, James Duffell, London, England - BOUNDLESS HIMALAYAS TREKKING & EXPEDITION (P.) LTD. 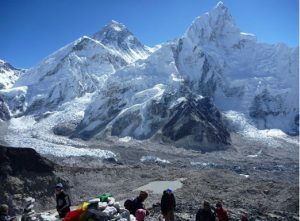 Thank you very much for a fantastic trek to Everest Base Camp. The trek was expertly organized and Kumar, our guide, did a great job at ensuring everything went smoothly. Kumar really helped us to acclimatize to the high altitude of the Himalayas, and guided us through all the different trekking challenges. We were all very pleased to make it to Everest Base Camp- it was well worth all the effort involved. We had some great – and fun – experiences along the way, and learned so many interesting aspects of the Himalayas and the Sherpa way of life. Would recommend Mongolian Trekking treks as a great way to explore the Himalayas and reach Everest Base Camp! A big thank you to Min, to Kumar our guide and to our extremely helpful porters.